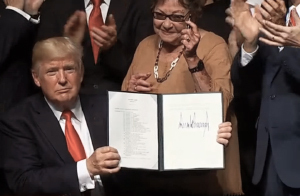 President Trump showing a signed executive order on Cuba policy, Fri, 16 Jun 2017 in MiamiOverall, I don't see anything in Trump's policy that will directly impact the Cuban Internet, but it will have an indirect impact by delaying the eventual rapprochement between the US and Cuba. On June 12th, I speculated on Trump's forthcoming Cuba policy and its impact on the Internet. He outlined his policy in a June 16th speech (transcript) and the Treasury Department published a FAQ on forthcoming regulation changes. It looks like my (safe) predictions were accurate. I predicted he would attack President Obama, brag about what he had done, make relatively minor changes that would not upset businesses like cruise lines, airlines, and telecommunication and hotel companies. I also said he would criticize Cuban human rights, while hypocritically ignoring the issue in other countries. For example, he slammed President Obama and bragged that "I am canceling the last administration's completely one-sided deal with Cuba." This does not come close to passing a fact-check. He said he was going to restrict people-to-people travel and stop people from doing business with companies owned by the Cuban Military, but that is far from canceling President Obama's "deal," which included little things like establishing diplomatic relations, reducing constraints on remittances, dropping the wet-foot, dry-foot policy, allowing US companies to do business with self-employed Cubans, allowing US companies to sell telecommunication equipment and services in Cuba, taking Cuba off the list of state-sponsors of terrorism, etc. You get the idea — he canceled none of this. His statements on Cuban human rights are either 100% hypocritical, or he has changed his mind since his speech in Saudi Arabia last month. At that time, he promised that "America will not seek to impose our way of life on others but to outstretch our hands in the spirit of cooperation and trust." If he really has changed his live-and-let-live human-rights policy, we can expect a spate of new sanctions, from Manila to Moscow. I had one surprise — his singling out hotels and other businesses operated by the military-run conglomerate, Grupo de Administración Empresarial S.A. (GAESA). Officials say existing hotel deals will not be effected, but the detailed regulations have not yet been released. This change will cut Cuban worker's jobs and GAESA's profit, but I guess the ban is good news for AirBnB and any future Trump hotel or resort in Cuba. How about changes affecting the Cuban Internet? I read the Fact Sheet on Cuba Policy, looking for changes that would affect the Internet, and did not find much. The first "key policy change" is "allowing American individuals and entities to develop economic ties to the private, small business sector in Cuba." Someone should let him know that President Obama made such changes some time ago, for example in allowing software imports from the private sector. In fact, someone should read him President Obama's 2009 Fact Sheet – Reaching out to the Cuban people. That document introduced many changes which enhance the ability of Cuban private, small businesses to "develop ties to the US," for example by authorizing "greater telecommunications links with Cuba to advance people-to-people interaction at no cost to the U.S. government." The fact sheet lists seven concrete telecommunication policy changes, none of which were "canceled" by Trump. He has canceled none of President Obama's changes to encourage private Cuban business and added nothing new himself. One change he did make is stopping "self-directed, individual travel" to Cuba. That will force would-be tourists to join fake groups and fake their travel reports or go to Aruba instead of Cuba, but it will not slow the deployment of Chinese telecommunication infrastructure. I hope Trump's policy will not undo the progress made by Google in establishing a relationship with Cuba and gaining permission to install Google Global Cache servers on the island. The servers are not yet in use, and when they go online they will have a small practical impact, but they indicate that Google has built trust and a relationship with the Cuban government and Internet community. I bet representatives of Google and other companies who have established relationships with Cuba are trying to reassure their counterparts that this is a temporary, unpopular change in US policy. Overall, I don't see anything in Trump's policy that will directly impact the Cuban Internet, but it will have an indirect impact by delaying the eventual rapprochement between the US and Cuba. The Cuban government will enjoy a few more years of claiming their economic problems are the result of the US embargo, the integration of the Cuban and American people will be slowed and The Chinese, Russians, and Iranians will have more time to establish political and business relationships in Cuba with diminished competition from the US. Trump's speech did not change much practically — its intent and impact were symbolic. It let him say he had carried out a campaign pledge, which was music to the ears of the Cuba-hardline audience at the Manuel Artime auditorium, named for a leader of the Bay of Pigs invasion. The talk lasted about 39 minutes with 53 applause breaks (50 for Trump, 3 for others) and a violin rendition of the Star Spangled Banner. Add to that the fact that Trump speaks slowly and repeats a lot of words and phrases, you realize that the speech was 90% political cheerleading and 10% content. You can watch the speech here on YouTube, but reading the transcript is a lot quicker. For a more comprehensive critique of Trump's Cuba policy see this article by Ben Rhodes, who was one of two White House staff members handling the negotiations leading up to our opening with Cuba. I also recommend the podcast interviews of Rhodes and Dan Restrepo, who served as a top Latin America advisor to President Obama and wrote a Cuban-rapprochement roadmap for candidate Obama before he was elected President. The interviews reveal President Obama's strategy and describe the negotiation process. Local Time: Wednesday, April 24, 2019 01:04 PM PDT – Page Load: 0.3216 Sec.